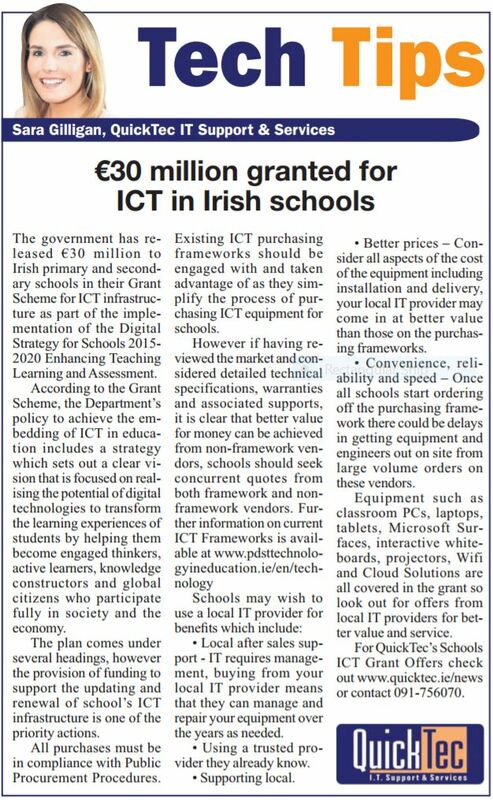 This month the Irish government announced that it had released €30 million to Irish primary and secondary schools in their Grant Scheme for ICT infrastructure as part of the implementation of the Digital Strategy for Schools 2015-2020 Enhancing Teaching Learning and Assessment. According to the Grant Scheme, the Department’s policy to achieve the embedding of ICT in Education includes a strategy which sets out a clear vision that is focused on realising the potential of digital technologies to transform the learning experiences of students by helping them become engaged thinkers, active learners, knowledge constructors and global citizens who participate fully in society and the economy. The plan comes under several headings, however the provision of funding to support the updating and renewal of school’s ICT infrastructure is one of the priority actions. Local After Sales Support- IT requires management, buying from your local IT provider means that they can manage and repair your equipment over the years as needed. Better Prices – consider all aspects of the cost of the equipment including installation and delivery, your local IT provider may come in at better value than those on the purchasing frameworks. Convenience, reliability and speed – once all schools start ordering off the purchasing framework there could be delays in getting equipment and engineers out on site from large volume orders on these vendors.